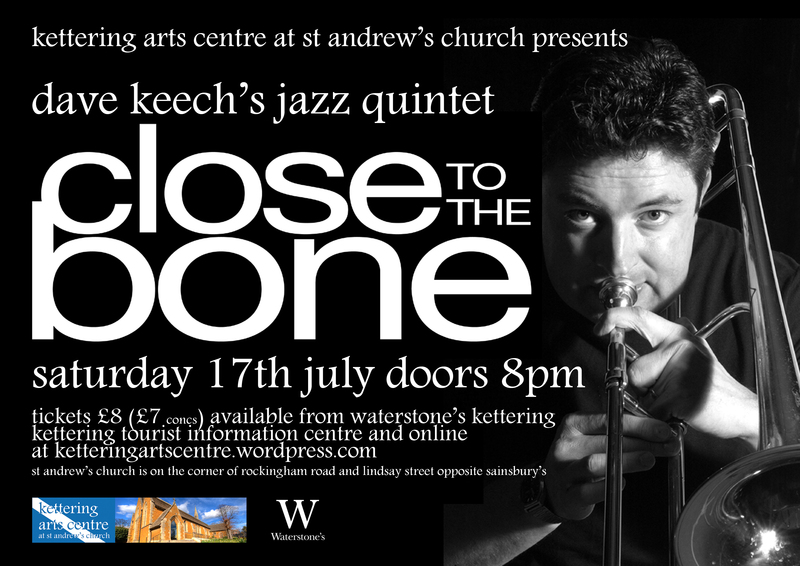 We had a fantastic summer evening concert on Saturday 17th July 2010, as Kettering’s own Dave Keech returned for a triumphant homecoming gig with his smoking hot jazz band, Close to the Bone. We had a superb response from those who came along, on the night and in letters, emails and conversations since. Kettering Arts Centre at St Andrew’s Church was buzzing! Thanks to all the volunteers who made the event happen: selling tickets, setting up, sound engineering, stewarding, running the bar. Loads of work went into a very successful night. The acoustic of the building really lent itself to the quality of the playing, and as the night grew dark the atmosphere intensified. A huge thank you to Dave and the band for a great evening-they’ll be back! Dave’s six piece band, Close To The Bone, draws on myriad influences ranging from Duke Ellington and Charles Mingus to soul, funk and hip-hop, and is a vehicle for compositions by Dave and co-writer Chris Lamptey. Dave’s composition “Demonology” co-written with South African producer and guitarist James Ribbans, has recently been selected for a forthcoming film on British sculptor and pop art giant, Sir Eduardo Paolozzi. Kettering will not see or hear better musicians this year! We have applied for a bar license, to complete the evening! Dave was born and bred in Kettering started playing the trombone at the age of 11 after being inspired by his grandfather’s brass band-fuelled passion for the instrument. He began playing in the school band whilst a pupil at Kettering Boys School and was taught by Maxwell Thornton, former trombonist in the GUS band. He was exposed to serious jazz at the age of 13 as a member of Bob Hunt’s Blue Rhythm Band (another KBS pupil and now MD for Chris Barber) and by 18 was playing professionally in pubs and clubs in various jazz groups. He was thus able to fund himself through art school, graduating with an MA from the Royal college of Art in 1989. Dave spent several years as a mainstay of the Ray Gelato’s Giants, touring extensively throughout Europe from northern Finland to southern Italy, as well as appearances at Montreal Jazz Festival and Carnegie Hall, New York. He made numerous TV appearances and recordings with Ray including the highly acclaimed “The Full Flavour” on Linn Records, on which one of Dave’s own compositions “Since You Moved In With Me” features. He then lived and worked in Japan, designing musical instruments for Yamaha by day and playing extensively and recording as lead trombonist with Japanese contemporary big band The Blue Notes Jazz Orchestra by night. When not performing, Dave runs London-based design company Keechdesign (www.keechdesign.co.uk), is a visiting tutor at the Royal College of Art, and is a trustee of the London-based arts charity, Olympian Arts. Paul Tucker was born in Essex in 1968 and started playing many instruments from a very young age before deciding on the trumpet in the late 70’s, eventually studying with the legendary Dickie Hawden at Leeds College of Music. He has been involved with many different styles of music, from brass bands to contemporary jazz orchestras, including spells working with pop/rock groups. He has played with artists such as John Dankworth, Kenny Baker, Bob Wilber, Kenny Wheeler, Jools Holland, along with many other groups and has directed, composed and arranged for many bands, including the Don Ellis Connection Orchestra, which he co-directed for 2 years, Obispo, the Afro-Cuban Salsa Project, and En Fuego, which he still composes and arranges for as well as playing in the band. 2007 saw Paul’s involvement with recording for the soundtrack to the film ‘Rise of the Footsoldier’ which was released at cinemas in July 2007, the track ‘Heaven Knows’, which features him on trumpet, is now available for download. Shaw and Barb Jungr at Ronnie Scott’s Club in London. He has played on various Film and T.V. soundtracks including Absolute Beginners and several comic strip films. African Freedom Day at Trafalgar Square in April 2006.
in October 2005 with Anders Jormin, Andy Sheppard and Rita Marcotulli.